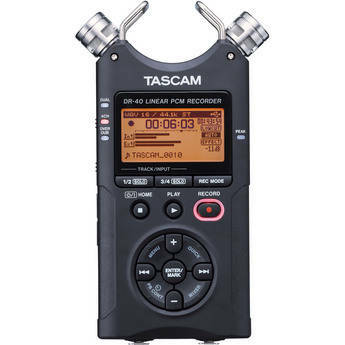 The DR-40 4-Track Handheld Digital Audio Recorder from Tascam provides professional-level features and flexibility in a compact and durable design that's ideal for use in the field. The unit can record high-quality WAV/BWF or MP3 files to readily-available SD or SDHC flash memory cards, allowing you to record hours of material and share it easily. A 2GB card is included so you can get started recording right away.The recorder features built-in adjustable condenser microphones, allowing you to choose an X/Y or A/B recording pattern to meet the needs of your environment and application.